MPSC Maharashtra Agriculture Service Main Exam 2018 - Apply Online for 399 Agriculture Officer, Taluka Agriculture Officer & Agriculture Deputy Director Posts in Maharashtra. Online Applications are invited by Maharashtra Public Service Commission (MPSC) from 24 Jul 2018 to 07 Aug 2018 for 399 vacancies. MPSC Maharashtra Agriculture Service Main Exam 2018 Final Answer: Maharashtra Public Service Commission (MPSC) has issued the Answer Key on 29 Nov 2018 for MPSC Maharashtra Agriculture Service Main Exam 2018. Answer Key can be accessed from the link given below. MPSC Maharashtra Agriculture Service Main Exam Answer Key 2018: Maharashtra Public Service Commission (MPSC) has issued the Answer Key on 15 Sep 2018 for Maharashtra Agriculture Service Main Exam 2018 which was conducted on 08 Sep 2018. Answer Key can be accessed from the link given below. On the basis of Written Examination (Prelims and Mains) and Physical Test. Eligible candidates may apply online at MPSC's website (direct link is given below) from 24 Jul 2018 to 07 Aug 2018. Candidates log on to https://www.mpsc.gov.in/. MPSC Maharashtra Group C Services Exam 2019 - Apply Online for 234 Tax Assistant, Steno & Other Posts in Maharashtra. Online Applications are invited by Maharashtra Public Service Commission (MPSC) from 16 Apr 2019 to 06 May 2019 for 234 vacancies. 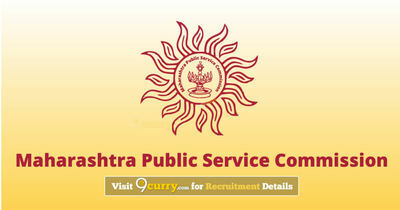 MPSC Maharashtra Engineering Services Pre Exam 2019 - Apply Online for 1161 Assistant Executive Engineer, Assistant Engineer & Other Posts in Water Resources Department, Public Works Department & Department of Soil and Water Conservation, Maharashtra. Online Applications are invited by Maharashtra Public Service Commission (MPSC) from 03 Apr 2019 to 23 Apr 2019 till 11:59 PM for 1,161 vacancies.